Ad-Exchange is a new and innovative script that will revolutionize internet marketing. 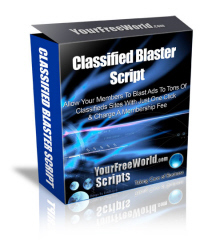 Blog Blaster Networks are an innovative idea in Web Marketing! You have to get on the bandwagon early if you are to reap the big rewards that are always seen by all early followers of a good thing. Allow Your Members To Blast Ads To Tons Of Classified Sites With Just One Click & Charge A Membership Fee! Automatically Generate Leads For Your Programs & Extra Income At The Same Time! Now Is The Perfect Time To Let Your Site Visitors Have Some Fun! Discover The Easy Way To Instantly Create A Popular Site With Good Humour! Big Size POP3 Mailboxes are still very much popular because of there continuous requirement at safelists and safelist submitters. How To Create Extra Revenue With A 3 Level Safelist Program! Here's A Value-Adding Service Script That Any Webmaster Would Be Proud To Own! Allow Your Clients To Automatically Submit Testimonials To Be Rotated At Your Website To Increase Sales! Who Else Wants Immediate Access To A Fully Featured Membership/Advertising Script? Sell 4 types of advertising packages: Banners, Link Ads, Paid Emails, Link Box Ads. How To Provide A Popular Service That's In Demand Online! How to Easily Build Your Own Online Store & Keep ALL The Profits! Fully Featured Surfing Program For Increased Profits!